Christmas is coming and that can only mean one thing. 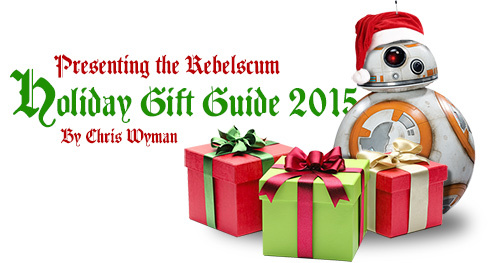 It's time for the 2015 Rebelscum.com Christmas Gift Guide where we highlight some of the many awesome collectibles and merchandise available as you search for that perfect gift for family and friends. WHAT YOU GET: Fellas, you can't go wrong getting your lady this new BB-8 themed bomber style jacket from Hot Topic. It's all the rage! 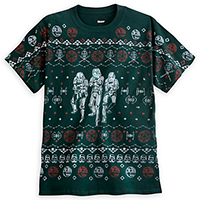 WHAT YOU GET: Not quite an Ugly Christmas Sweater, but perfect for the occasion. 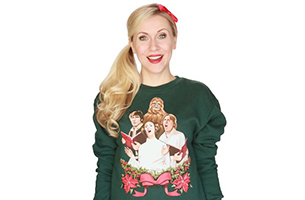 Check out this Star Wars Holiday Special themed pullover featuring Han, Luke, Leia & Chewbacca belting out lines like: "We celebrate a day of peace, a day of harmony..."
WHAT YOU GET: As a follow up to last years red Darth Vader shirt, Disney Parks has a new herringbone stitch screen art Christmas shirt featuring all things Empire. You can find this both on the Disney Store website and in the parks. WHAT YOU GET: This is a fine example of a great Star Wars novel. Based on the super popular Star Wars Battlefront video game and set between (and during) Episodes IV & V, the book is a breath of fresh air telling tales of gritty war capturing the essence of everything we love about the Star Wars universe. WHAT YOU GET: If you know someone that's an art fan, a tattoo fan, a Star Wars fan or a fan of big heavy books, you'll want to consider The Force In The Flesh Volume II. Author Shane Turgeon delivers another incredibly high-end look at some of the best Star Wars tattoos in the world along with some of the most well-known artists in the business. WHAT YOU GET: Set past the destruction of the second Death Star, this book includes all four issues from the first arch of the Star Wars: Shattered Empire comic series. It's our first look at the new canon post-Return of the Jedi story line in this format and a must-read for Star Wars fans young and old as we count down the days until The Force Awakens. 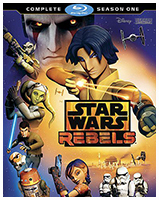 WHAT YOU GET: Children and adults alike will appreciate receiving the first season of Star Wars Rebels on Blu-Ray (or DVD). Supervising Director Dave Filoni takes us on a journey through Star Wars just before the formation of the Rebellion in a new animation style with music that dips into classic John Williams tunes and pulls you into the stories and characters in a way that is reminiscent of Star Wars: The Clone Wars, yet vastly different. With a run time of approximately 331 minutes and several bonus features, you can't go wrong. 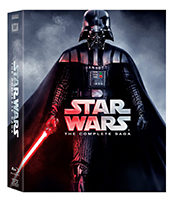 WHAT YOU GET: Disney repackaged all six Star Wars films in a special 9-disc set that's loaded with special features. You can also grab each film individually in a special new Steelbook packaging. Let's face it, we all know at least one person that hasn't seen the films, so what could be better than opening a set of Star Wars movies on Christmas morning? Do what must be done! 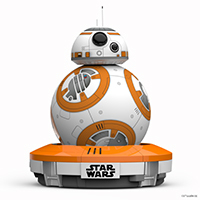 WHAT YOU GET: During the Force Friday toy launch in September, BB-8 by Sphero was the hottest item around and he's still sought after by many. Controlled by an app on your smart phone or tablet, you can guide BB-8 around the house, the office, at school, and even outdoors. You can record holographic messages and watch as he learns from your interactions and recognizes your voice. Give the gift of high-tech Star Wars this Christmas! 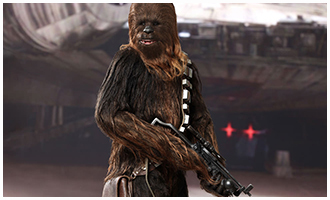 WHAT YOU GET: If someone you know is looking for a high-quality 1/6th scale Chewbacca figure, then Hot Toys has you covered. Although it's on the expensive side, it blows away any previous figure with realistic, movie accurate fur based on his A New Hope look. Of course, that begs the question...what can you get a Wookiee for Christmas (when he already owns a comb)? WHAT YOU GET: For the action figure collector in your life, check out the new 7 1/4-inch Captain Phasma Die Cast figure exclusively from Disney Store and DisneyStore.com. 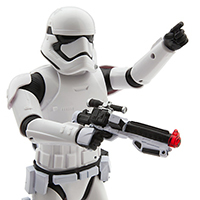 It's fully poseable and comes with a molded cape, blaster & base. Also, be on the lookout for Finn, Rey & BB-8, Kylo Ren, First Order Stormtrooper and the Flametrooper from The Force Awakens along with Anakin Skywalker, General Grievous & Darth Maul from the Prequels and Boba Fett & Darth Vader from the Original Trilogy. WHAT YOU GET: The 1/6th scale talking action figures from Disney Store are sure to be a big hit under the Christmas Tree this year. 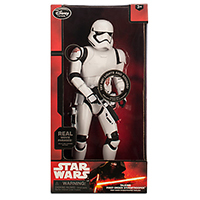 With 8 different real movie phrases & sound effects from The Force Awakens and full articulation, it'll be hours of fun for the little kids and of course, the big kids. Also look for Kylo Ren, Finn, Boba Fett & Darth Vader! WHAT YOU GET: Ever wish that when you played with your toys, they'd play back? 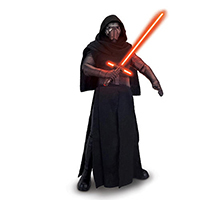 Well, that's exactly what this Toys 'R Us exclusive 17-inch interactive Kylo Ren figure does! With 31 points of articulation, a talk mode & training/battle mode, he will perform realistic lightsaber moves and teach you in the ways of the Dark Side. You can also look for other interactive figures from Thinkway Toys including Darth Vader, a Stormtrooper, Chewbacca, C-3PO, R2-D2 & an AT-AT Walker! 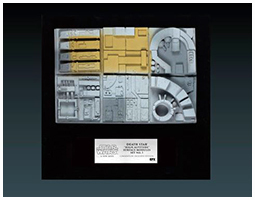 WHAT YOU GET: Initially available as an exclusive at New York Comic Con this year, EFX Collectibles has some of their ultra-cool Death Star Surface Modules left over which would certainly bring a smile to that high-end collector in your life. Molded from the original tiles, EFX has created a wall-mountable display piece that features some of the "high-altitude" squares as seen in A New Hope. The set comes with a metal plaque and Prop Story/COA. WHAT YOU GET: It's the ultimate stocking stuffer. Surely you family or friends will have already seen the film by Christmas, but it's Star Wars on the big screen, so going to see it multiple times is necessary. What better than a gift card to their local theater for repeated viewings? WHAT YOU GET: For the action figure collector in your circle of family and friends, consider this EntertainmentEarth.com Exclusive 4-pack of The Black Series 6" figures. Included in the set: Sandtrooper Sergeant, Crimson Stormtrooper, Lieutenant Oxixo (TIE Fighter Pilot), and R2-Q5. All are brand new and have never been released in this line previously. WHAT YOU GET: Here's a fun way to display your Christmas stockings throughout the wintery month of December. Let Darth Vader handle things! 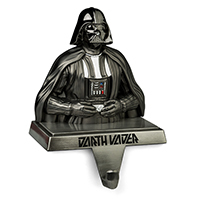 Available exclusively through ThinkGeek, the holder stand 4 1/2" tall. WHAT YOU GET: It's the gift that keeps on...showering? That's right, you can now be sprayed down by your favorite little astromech droid, R2-D2 in three different spray settings! 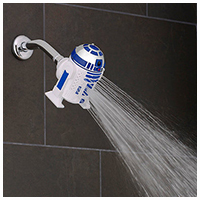 Thanks to Oxygenics, Star Wars has made its way into the plumbing category and you must know at least a handful of fans that NEED one of these. 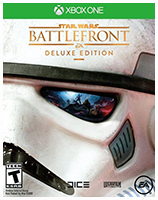 WHAT YOU GET: It's the third title in the Star Wars Battlefront series, a first and third-person shooter and one of the most anticipated Star Wars video game in years. 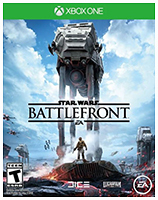 Developed by DICE and published by Electronic Arts, it puts you right in the middle of all the action from the Star Wars films. For platform choices, you can select between the Standard or Deluxe version of the game for X-Box One and PlayStation 4 or the Standard version for Microsoft Windows. While mainly a multi-player game, there are single player modes that you can train on before jumping online with others around the world. 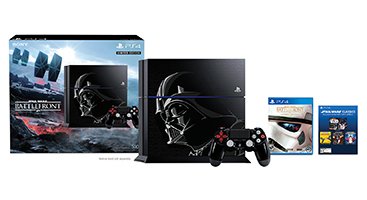 WHAT YOU GET: If the person you are shopping for doesn't already have a game console, consider this Limited Edition Star Wars Battlefront themed PlayStation 4 featuring Darth Vader which comes with the Deluxe version of the game, a controller, a headset and a voucher for 4 Star Wars Classics games. 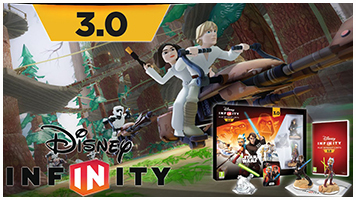 WHAT YOU GET: With the latest version of Disney Infinity, you can take control of numerous Star Wars characters and use them in playsets like Star Wars: Twilight of the Republic, Star Wars: Rise Against the Empire and Star Wars: The Force Awakens in addition to the Toy Box where you can mix and match characters from all of Disney's franchises including Star Wars, Marvel and Pixar. The characters are sold individually carded and also make for some great collectibles even if you aren't playing the game.